Among other big debut issues this week, Peter David and J.K. Woodward's FALLEN ANGEL series launches again. So to celebrate that, here's the cover to the concluding FALLEN ANGEL: REBORN #4. 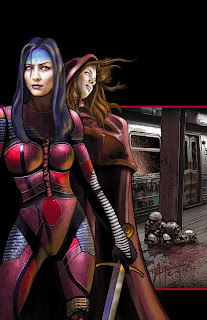 J.K. and Nick Runge have been the cover artists on the series up til now, but this month, artist Johnny Atomic contributed this special image of Liandra and special-guest Illyria.